I don’t do once a month cooking because my freezer is small and will freezer burn food by the end of the month. Also there is the whole devoting an entire weekend to making giant batches of food all day when we all know my weekends should be devoted to sitting on the sofa and petting Lacey all day until my arms fall off. I'm not completely unreasonable. You take me for walks too. Just as long as you spend all of your waking hours with me its all good. I’m going to do this on a very small scale. I’m going to try cooking make a head meals by cooking an extra large batch of food for dinner every once and awhile, vacuum sealing the leftovers, and freezing them for a homemade heat and eat meal when we need it a week or so later. My first freezer meal recipe wasn't a traditional freezer meal recipe. It was something I've wanted to try making at home – pastie (pronounced paa-stea.) A pastie is a hand meat pie that looks like a turnover. Instead of finding apples or fruit inside, it has a meat and vegetable filling. My first pastie attempts didn’t look like the perfect turnover like shape. The yummy taste made up for my fail in the looks department. I wasn’t sure what type of pastie I wanted to make (Cornish, Irish, etc.) I Googled until I found a Michigan Pastie Recipe (get it here) that looked good. I made the recipe as written with the exception of the dough I used lactose free milk and Bisquick to make the dough because I stink at making pastry dough that is suppose to behave like pastry dough. The recipe makes a lot of meat pies. After failing to make several meat pies that looked nothing like a pastie, I pulled out a cupcake pan and used it to make small lunch size pastie with the rest of the filling and dough. Cute bite size beef pastie! I baked the pastie according to the recipe and allowed them to cool. Then I vacuum sealed them with my Food Saver and popped them into the freezer. The pastie froze and reheated well. Vacuum sealing the meat pies kept them safe from my nemesis Freezer Burn. Success! 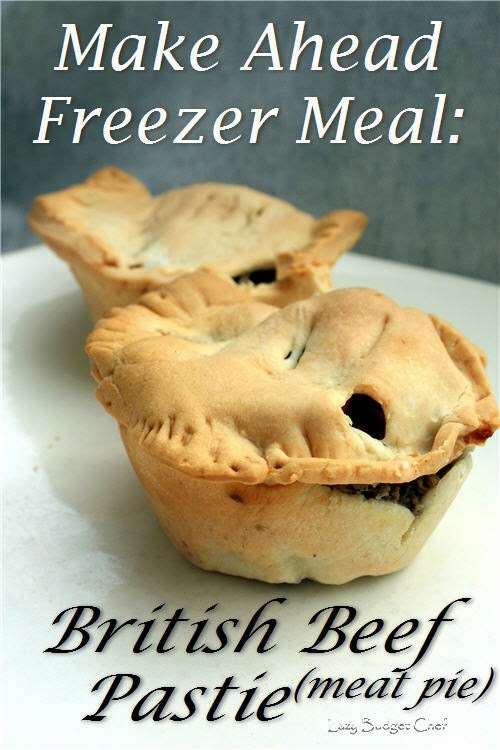 What are your favorite make ahead freezer meal recipes?